Selections from Teen Muse Project, on display at The Muse Hub on Friday. 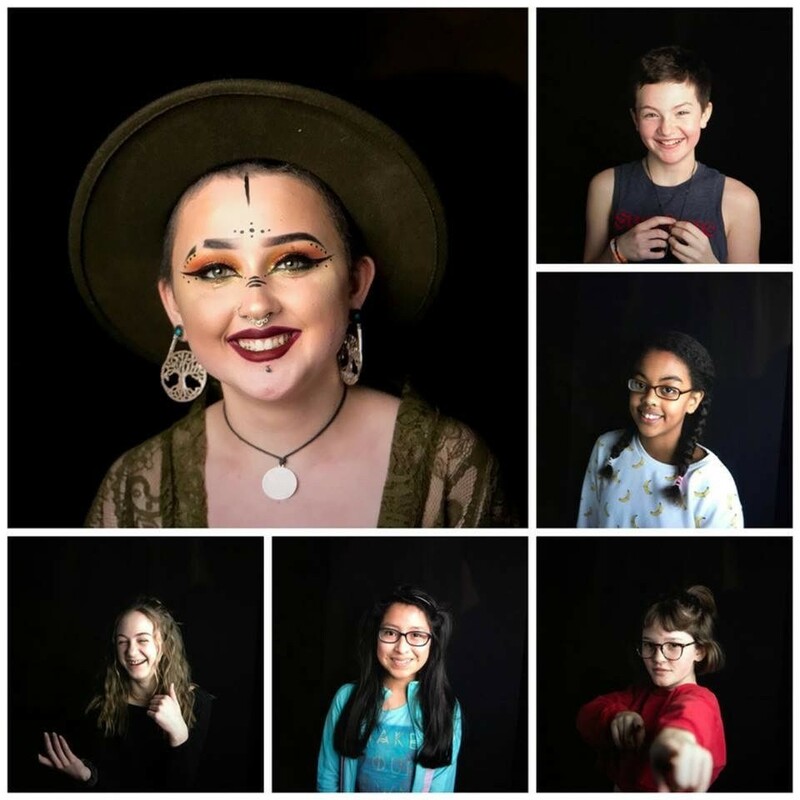 Muse Conference, a four day event celebrating women and girls as catalysts for change, is this weekend and in addition the multitude of activities and workshops planned in Bend, a Youth Panel made up of local teens is scheduled for Friday afternoon. Ashlee Davis, a counselor at Pacific Crest Middle School, is an advisor for the Teen Muse Club at Pacific Crest as well as the moderator for Friday’s discussion. Davis has advised the club for the past two years, one of ten other clubs in local schools, and says she has seen it grow from 10 girls to 30-35 girls attending each week. Pacific Crest Middle School and what to expect from Friday’s panel. SW: Each club chooses to focus on a social issue of their choice, correct? DAVIS: Our girls right now are focusing on a campaign they started called, “Ignite Change | Spark Kindness” their focus is to reduce hate speech and bullying type behaviors that go on at our school. SW: What does the campaign entail? on in terms of conversation. That forged and transformed into the campaign. change in our community. They ran a weeklong kindness station… where each day was something different. SW: What will the panel be formatted? DAVIS: We have four girls from our club, we have girls from local high schools here, Summit and Bend High, then we have a couple of girls from, I believe one from Culver and one from Madras, who will be participating. It’s a format I did it last year and what I walked away from is that adults very rarely just sit and listen to teens and their experiences. What life is like for them, the struggles that they face and the really amazing things that they’re capable of. You know, adults often just like to give ideas and fix problems and give their input. Really, it’s a time for teens to be given a platform to just talk about things that impact them on a daily basis thing that they are passionate about thing that they’d like to see change around. to add on and hopefully it’ll have a natural flow to it. SW: Any specific topics you’ll be covering? SW: Following the Parkland school shooting and the multiple threats of gun violence in schools in our area recently, can I assume these recent events will be on the table for discussion? DAVIS: Yes, that is something that all of the girls said that they want to talk about just from the teen perspective. Not only focusing on what we’re doing wrong but also what can teens do to start to be the change. And one of the things that came up in the group (Thursday) was around what are these small acts that teens and adults have control over that we can start changing. And one of the things that they kept talking about was noticing when kids are not connected at school or withdrawn socially or isolated, what can we do as other humans to connect and support them. Then they talked about mental illness and the need that we have as a community to educate not just adults but more so teens around mental health issues and how can we connect teens to services how can we start educating and supporting teens with their needs. I think that is a topic that will definitely come up. SW: Have you moderated in past years? How was the turnout and format? DAVIS: I moderated the one last year as well. We’ll leave probably 10 minutes or so at the end to ask questions and there were a lot of questions (last year). SW: Anything else you’d like to add about this year’s panel? And I was explaining from the adult’s perspective that it’s a rare opportunity to learn from teens and sit and hear their perspective. from you every day in terms of your creative ideas and your passion and the way that you view the world. I don’t know how to word that in a way that would go in a newspaper, but these kids are truly incredible. They will change the world, and they are changing the world, and we need to listen to them. We need to listen to what they have to say. They have valuable ideas and thoughts and opinions and they care. I always thought it was cheesy whenever I was a kid and adults said “you are the future.” But it’s true. Sitting there and watching them each day—they are incredible. just pre-register online at theworldmuse.org.